Shirts With Random Triangles: A Johnny Manziel piñata? A Johnny Manziel piñata. 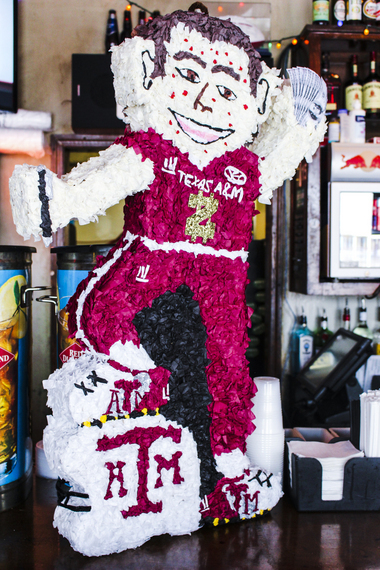 You know it's Alabama-Texas A&M week when an Alabama sports bar has a 30-inch tall piñata in the shape of Aggies starting quarterback Johnny Manziel constructed. Like there really needs to be a reason to construct a Johnny Football piñata, right? Otey's Tavern in Mountain Brook, Al. had the one pictured built (dubbed "Johnny Piñata," of course), complete with a sharpie in one hand, and play money in the other. Think it's easy to get a Johnny Football piñata constructed? Think again. It took a bit of searching for the man who handles Otey's Tavern's marketing, Harry Long of 81 Shop, before he found Shelly Pricer of Cullman, Al.-based It's My Party who could do the job. "She did not know who Johnny Manziel was," Long said. "I explained to her who he was, and she looked him up and did a great job. "He's 30 inches high," Long added. "At Otey's, we're joking that he's life size." The piñata's been filled with "prizes and gift cards," with plans for customers to take their best shots at it during the tavern's weekly trivia night on Wednesday. They're bound to have better luck whacking the piñata than the Crimson Tide defense did last year.